For a race that has a reputation as being somewhat of a parade, yesterday’s Honda Indy 200 at Mid-Ohio was anything but processional. While the new unified aero kit may still need tweaking at some of the ovals on the Verizon IndyCar Series schedule; the series should be given high marks for how much better the car races on road and street courses. The race at Toronto two weeks ago was probably the best I’ve seen there, and I can now say the same for yesterday’s race at Mid-Ohio. From the moment the green flag waved on the backstretch – which is a curiosity about Mid-Ohio – there was action throughout the field. It started when pole-sitter and eventual race winner, Alexander Rossi, slowed the field to a crawl before taking off at the start. Paul Tracy called it a dirty start, but watching the replay – I saw nothing wrong with it and apparently Race Control saw nothing wrong once they reviewed it. But Rossi was able to pull away from the rest of the field from the start. That’s not to say that he was unchallenged on his way to his second win of the season and fourth in his brief career. Josef Newgarden pulled off a bold move and passed Rossi for the lead, though it never showed on the scoring summary. Newgarden pitted at the end of the same lap and Rossi crossed the line ahead of Newgarden, so Rossi was credited leading that lap as well. In fact, Josef Newgarden was not credited with leading a single lap all day; even though he ran a strong race up near the front all day long. Rossi was strong all day, but according to the box score – he dominated. He led sixty-six of the ninety laps, partly due to a two-stop strategy that he and his team worked to perfection – despite the fact that there were no caution periods throughout the race. Based on the amount of red flags in practice and qualifying, most people (myself included) thought that there would be a ton of yellows during the race. No other driver opted for a two-stop strategy, and it could not have worked out better for Rossi. Until his embarrassing attempt at a victory donut, Rossi did not put a wheel wrong all day. When Rossi came out of the pits on cold tires, he had a masterful battle with Scott Dixon who was on warm red tires. Most everyone thought that Dixon would have been able to get past Rossi on cold tires, but Rossi held him off as his tires got up to temperature. After that battle with Dixon, Rossi wasn’t seriously threatened for the rest of the day. Scott Dixon is still leading the points race – but after finishing fifth, his lead has gone from sixty-two points down to forty-six. And his nearest pursuer is no longer Josef Newgarden, who finished fourth – it’s Alexander Rossi. Robert Wickens drove another good race, albeit on a slightly different pit strategy, to finish second. Will Power rounded out the podium which had drivers from three different teams and two engine manufacturers. Honda has now won eight of the thirteen races this season, with four to go. Chevy has only won once since the Month of May; when Josef Newgarden won at Road America. I cannot remember when I’ve seen as many outside passes on any road course as we saw yesterday – much less at the tight confines of Mid-Ohio. After the race, Josef Newgarden said it was all due to the new body kit – which he described as forgiving and allowing the driver to slide around more. I’m translating that as putting the car back in the hands of the drive, instead of the engineer who sets it up. That also translates to entertaining races like we saw yesterday. So now we set off into a long break. It’s still July, but August will be almost two-thirds gone when the series cranks back up at Pocono for the final stretch when there will be four races over five weekends. Based on what we’ve seen in the past month of so, it promises to be an interesting wrap-up to the 2018 season. TV Coverage: I’m beginning to sound like a broken record, but I wish Jon Beekhuis would become a permanent part of the NBCSN crew next season, when they begin being the exclusive television partner of the Verizon IndyCar Series. He is so insightful on pit strategy and how to set up a car, and he has a way of explaining how so that we can understand it. With NBC only having the second half of the NASCAR schedule, I understand that Marty Snider doesn’t have a whole lot to do in the spring. But I wish they could find another use for him and let Beekhuis have the IndyCar gig to himself. As for yesterday’s production, I thought it was a good day overall for the NBC crew. Robin Miller had another good segment, this one on Graham Rahal. If I want to be picky, I think Townsend Bell needs to refresh his vocabulary. For the third race weekend in a row, he has overused the term “elbows out” to describe a driver muscling his way past another. He used it twice yesterday and once in qualifying on Saturday. He needs to find another descriptor. The Command: For the past couple of years, I’ve noticed that the traditional command to start engines has gone from Gentlemen, Start Your Engines or Ladies and Gentlemen… to a more gender-inclusive Drivers, Start Your Engines. Even Tony George has opted to go with Drivers the last two years at the Indianapolis 500. While I understand that the latter is more politically correct in these times, I am also a traditionalist that doesn’t like to see traditions tossed aside. That’s why I was thrilled when Vicki Poponi, the VP of Auto Sales Operations for Honda used the traditional Gentlemen, Start Your Engines when she gave the command at yesterday’s race. It’s a little thing that most of you will probably not agree with me on, but it just seemed more familiar and it put a smile on my face. Remember – I live by the mantra that Change is Bad. Three Hundred Starts: Yesterday was Scott Dixon’s three-hundredth career IndyCar start. When you think that some IndyCar seasons in his career have had as few as fourteen races – that’s a lot of seasons for the four-time champion. It’s a remarkable achievement. At the age of thirty-eight, he shows no signs of slowing down. He may be well on his way to his fifth championship and third since 2013. His future may be uncertain as to who he will be driving for next season, but it will be his choice – not someone else’s. I think a lot of IndyCar fans take Scott Dixon for granted. His quiet unassuming personality makes it easy to forget that we are witnessing greatness every time he crawls into the cockpit. I grew up in a time when AJ Foyt, Mario Andretti, Bobby Unser and Al Unser were all in their prime and at the top of their game. I didn’t realize what I was witnessing until years later, when they were either retired or racing long past their prime. Scott Dixon is still at the top of his game. Take it all in these next few races this season and the next couple of seasons. Don’t wait until he is on the sidelines to appreciate what he is now. If you watched the race, you know what I’m talking about. 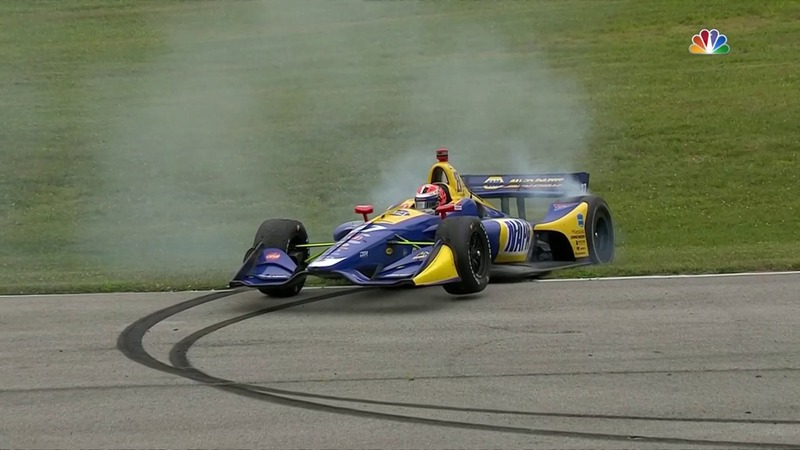 After Rossi took the checkered flag for his second win of the season, the usually reserved and stoic Rossi decided to show his exuberance by doing some Alex Zanardi-style donuts near the keyhole at Mid-Ohio. And then it all went terribly wrong (with apologies to the late Lou Palmer). Rossi completed about half of one donut before the back-end of his car dropped off of the track and his car slid off onto a crest that grabbed the bottom of his car while his front wheels were suspended in the air. It was not a good look for someone who had just finished dominating the race. Give Rossi credit, though. In the eventual victory lane interview after his car was rescued, he didn’t wait to see if Kevin Lee was going to bring it up. He brought it up himself in his usual deadpan humor in a self-deprecating way that had to make anyone laugh. Drive of the Day: There were many drivers that could have been given this coveted award. Certainly Alexander Rossi could have by winning from the pole, and defending his position from Scott Dixon who wanted it badly as Rossi was coming out of the pits. But starting first and finishing first does not turn a lot of heads. Simon Pagenaud would certainly qualify. He made up for a poor showing in qualifying and moved up through the field after starting seventeenth to finish eighth. Zach Veach and Marco Andretti both had nice drives and moved up from their respective starting positions. But there is really no question who had the drive of the day. Sébastien Bourdais started dead last in twenty-fourth after crashing in qualifying. He drove like a man possessed from the drop of the green flag to finish sixth. Had there been more time, I’m certain he would have moved up even more. Bourdais did this strictly on speed and bold moves. There were no yellows for him to take advantage of. He was on the same three-stop strategy that all drivers, besides Rossi, were on. There was absolutely no luck involved at all. He earned every position he took. If he could somehow find a way to start the majority of his races from the first three rows, there’s no telling how high he would be in the points standings. As it is, Bourdais currently sits in tenth place. All in All: Over the last three decades, I’ve watched a lot of races at Mid-Ohio and dozed through a few of them. I did not doze off yesterday. In fact, I feel confident in saying that yesterday’s race was the best overall IndyCar race at Mid-Ohio I’ve seen. I say overall because there have been more memorable moments, like Michael Andretti tumbling through a gravel trap there in the late nineties, or Marco Andretti flipping upside down on the opening lap about ten years later. But I would be hard-pressed to name a more entertaining race from start to finish at Mid-Ohio than the one I saw yesterday. There were multiple passes being made on the outside, there was contact with no cautions and there were multiple strategies. At one point just before the race was half over, I honestly had no clue who was going to win. It could have been Dixon, Bourdais, Power, Newgarden or Wickens. But in the end, it was Alexander Rossi who made his two-stop strategy work. In the process, he maxed out on points for the weekend and tightened up the championship. He also gave us a lot to talk about between now and Pocono. This entry was posted on July 30, 2018 at 4:02 am and is filed under IndyCar. You can follow any responses to this entry through the RSS 2.0 feed. You can leave a response, or trackback from your own site. Probably the most entertaining IndyCar race I’ve ever seen at Mid-Ohio, really enjoyed that one. For not the first time this season, it felt like a proper old-school race. PT was in quite the form on the broadcast, and not in a good way. I mean, he was as entertaining as ever but it seemed like half of what he said was out of left-field or was just completely wrong. Townsend called him out on it several times and I’m starting to get the feeling he’s getting a bit frustrated with it all. I agree with you on Tracy, however, I thought Bell had a rough day as well. He seemed to miss a few things too, his occasional efforts to match Diffey’s bombast fell flat, and his “correcting” Tracy often came across as forced attempts at starting some corny conflict banter. I generally prefer Beekhuis as a pit reporter, but for this race I agree with George that he should be in the booth. For one thing, he is the most qualified person on the broadcast to discuss pit and fuel strategy. For another, he could provide some respite from Tracy and Bell’s dueling ex-drivers act on one of its off days. Take the best of Tracy and the best of Bell and combine it with Beekhuis, and you’ve got a great booth. Great day all around for Mid Ohio. The crowd was the largest I’ve seen since the ALMS days. Really good race. Maybe Bourdais could start at the back every race. Would have been even more fun if Wickens had got by the slower cars to possibly challenge Rossi. It was the best race at mid ohio, I’ve ever seen. And it was one great race, compared to all races. I hope they can get the oval package up to this standard. I couldn’t agree with you more about Jon Beekhuis and “Gentleman Start your Engines”. Jon Beekhuis is the best and should be there every race. Hopefully Marty can find work elsewhere. I cringe, especially at the Indy 500, when “Lady and Gentlemen start your Engines” hasn’t been used now for two years. Hopefully your article will be read and taken to heart. And, yes, it was a fun race to watch. Gentlemen, start your engines (or Ladies and Gentlemen, or Lady and Gentlemen) is so traditional and old-fashioned and polite that it makes me happy also George. I was truly surprised that no one else besides Rossi attempted to run the two stop strategy, not even one of the guys qualified in the back. Bourdais passes were unbelievable. He’s a great driver but there must also have been one heck of a set up on that car to allow him to brake deep on outside and stay on track over-and-over-and-over again without destroying those tires. Big kudos to Pietro Fittipaldi for acknowledging that he was there to turn laps and gain experience as he politely made room for the leaders when getting lapped. Race control sure had a busy day of deciding not to take action. The start was awful and I would have waved it off. Tracy was totally correct that Rossi played dirty and brake-checked the field. However, in recent years, Indycar has pretty much never waved off starts or restarts for brake checks. So, while I would argue that Rossi’s action was dirty, it is clearly allowable under recent officiating. There was also a tremendous amount of blocking yesterday, though a lot of it looked looked to be of the so-called “Pruett fade” or “Brazillian weave” variety. Again, race control set a precedent for not calling it and it continued throughout the race. There was plenty of good action and plenty of passing in spite of this, but there could (should?) have been more. The move from “gentlemen” to “drivers” always seemed to me like a response to a complaint no one ever made, I was happy as well to hear the traditional command. The Indianapolis 500 made those words iconic, and I never saw any need or request to alter the command. Other recent uses of “gentlemen, start your engines” include both Barber and Gateway last season, given by Honda’s robot and John Bommarito respectively. One factor that Bourdais mentioned that helped him passing so many as he did during the race, was the situation that he did not qualify. By not qualifying he had additional sticker ‘reds’ that were allocated for qualifying but were not used. No commentator asked Sebastian if he had it to do over again would he have preferred to qualify or have the option of the extra sticker ‘reds’ to use during the race…. 2. When is Bell going to propose to Newgarden? 4. It sure seemed like the Newgarden and Dixon teams were affraid to let the other go on a different strategy. That worked well for Rossi on Sunday, but this is still feels like a 1 v. 9 Championship battle. 5. Dixon joining the dark side? Miller dropped a nuke with the Dixie-Penske rumor.